Several years ago, I was reading some work from Dan Boettner, a writer and explorer with National Geographic, on Blue Zones - pockets of population in the world where people regularly live to be 100 without disability. He found that the people of these Blue Zones shared some common characteristics. One of these is a sense of purpose in their lives. Okinawa, Japan is one of these Blue Zones and the people living on this island in the South China Sea have a special name for purposeful living: they call it Ikigai. While there is no direct translation into English, I am fond of this definition: the reason I get up in the morning. The illustration above helps to define the balanced state the Okinawans revere. With this chart, you can plot aspects of yourself and your life in four areas, and in two continuums. 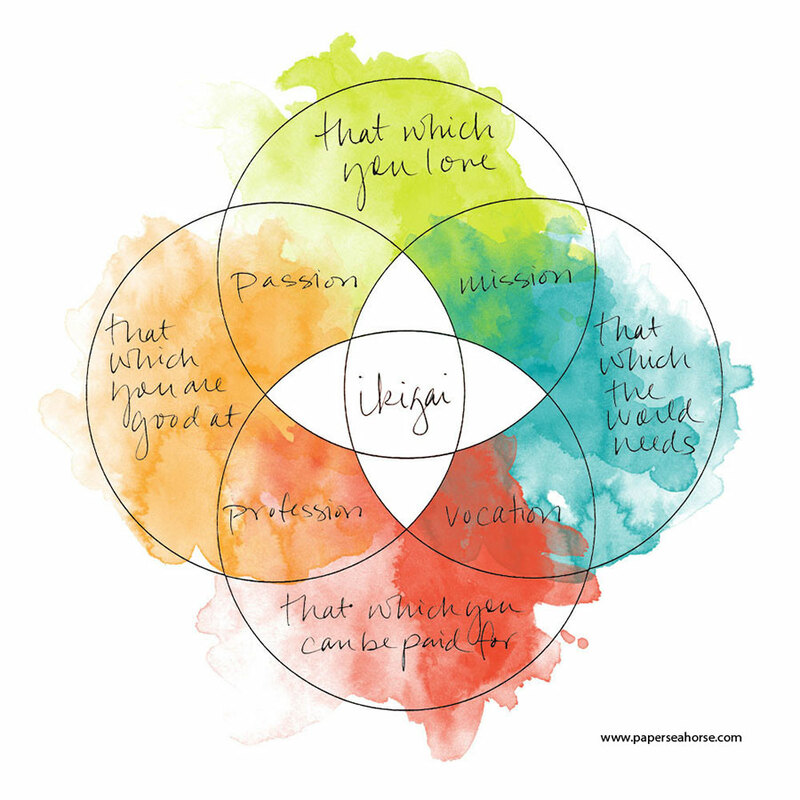 Your Ikigai, or purpose for getting up each day, is often found where these four converge. Keep in mind that this does not have to be a "job" or Career. It is often expressed in Japan as "I am the one who..." For some it could be "I am the one who makes everything pretty." My partner Tona Bell and I have designed a powerful workshop that guides people through this process with a variety of interactive and creative exercises. As a warm up, we had people rapidly answer these questions. Little thinking is required here, just responding to the question from your gut. In our workshops, we use many different ways of getting to your truth about these four areas, but I think that you can get a lot out of just the rapid fire questions below. What is your favorite bad habit? A Surprise gift arrives for you. What do you hope it is? Remember the last time you smiled so hard it hurt...what were you doing? What do you feel really happy about in your life right now? What do people always telling you you are amazing at and you should do it professionally? What do you know so well that you feel compelled to share? When you go to a bookstore what section do you gravitate towards? With focus, what could you conceivably be the best in the world at? What are you so good at that people are always coming to you for help? What about your life right now makes you feel proud you can make a difference? How do you give back? What is your service to others? In your family and community you are a super hero...what is your power? What was your favorite childhood job? A friend got you a booth at a market where anything can be found. What is your booth? You find yourself in a strange town with only a $100, what do you do to earn a living? Of all of my skills and talents, the top three most valuable are:? When you have your answers, take each one and place it fit on the Ikigai chart where it feels like it should go in relation to the two axis. Again, overthinking can cloud the results. Just use your intuition to place your answers. Note what answers fall toward the sweet spot in the center of the chart. While you may or may not have a life changing epiphany, you very likely will get a valuable glimpse into what is your higher purpose. In our workshops, we have had a wide variety of reactions to this conclusion ranging from, “This is what I thought all along” to “Damn! Why didn’t I see this before? Now I have to change everything .” I wonder what you will find. Please let me know.